Electronic print time recorder features easy one-handed, trigger-trip recording. Card or paper form activates printing mechanism. Time on face matches time stamped. Month wheel manually advances. Easy to install on a wall or table. 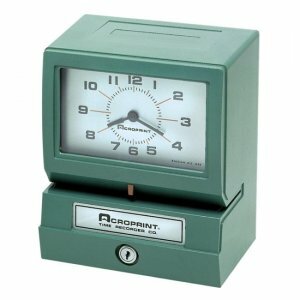 Time recorder offers a rustproof and corrosion-resistant construction.